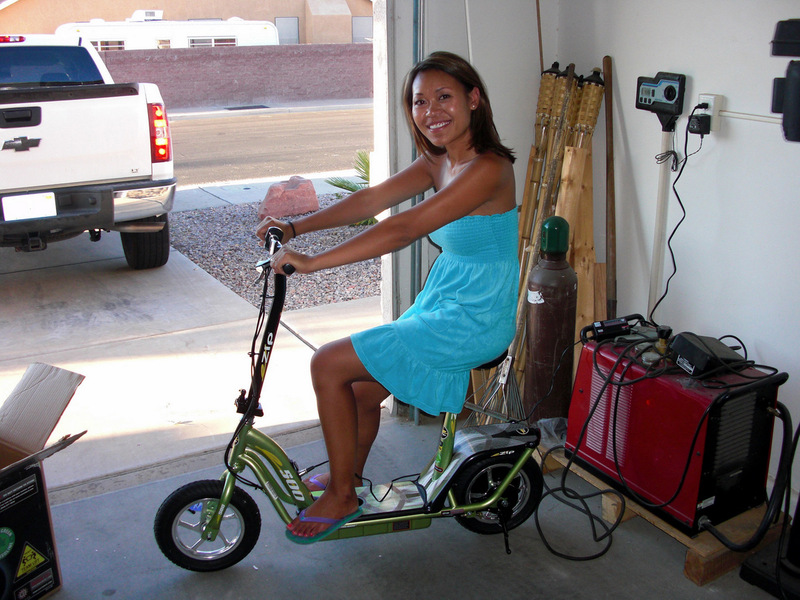 Before I got a road bike to take the emerging passion I have for riding a stationary bike to the outdoors, I got an electric scooter. I was fed up with hiking back and forth across campus between two offices in the summer heat while carrying multiple bags on my shoulder. I know using a mode of transportation other than my very own two legs goes against the grain of my philosophy--that physical activity does not have to be structured such as exercising at a gym but I'm justifying that getting to the gym faster will allow me more time at the gym. Last week was tough for me. The weather was hot and humid and I was running ragged from inadequate nutrition. There were a couple days where I dreaded the walk to and from the gym which is not fun in heels and slacks. I like working out; it's getting there that was becoming a drag since my more permanent office was a lot farther away from the gym since I moved offices. I'm a believer of doing any little thing because the little things add up, slowly but surely. Taking the stairs as oppose to an elevator, parking at the far end of the parking lot (which also avoids door dings) and walking rather than catching a ride in a golf cart or in my case, riding an electric scooter. Being active doesn't have to mean changing into workout clothes or dripping in sweat. I love moving around purely for the mental break, fresh air and stretching my limbs. My husband worries about me not getting my walks in and half-jokingly threatens to take my scooter away if I start to gain a significant amount of weight because of the missed opportunities to walk...LOL. What he doesn't know is before August, I only walked across campus solely for the gym (which was most of my walking for the entire day); not walking back and forth between buildings hauling about 10 pounds total in baggages. The running back and forth not only took time away from my day but derailed me from my routine of proper and timely nutrition. I was a complete wreck since the beginning of August and it was starting to get really old. So I used my scooter at work today for the first time and I have to admit that running errands was a lot easier and going from building to building for meetings has lowered my stress level to make it on time. The biggest plus is what I lose by not walking, I've made up in time at the gym.